Stanley Felderman and Nancy Keatinge, founders of Los Angeles-based design firm, Felderman Keatinge & Associates, share seven realities that show we’ve reached the tipping point of technology in the workplace. A communal space at entertainment law firm Morris Yorn’s LA office. Photo courtesy of Felderman Keatinge & Associates. The tipping point for technology running our lives has arrived. In the workplace, technology is allowing for space to become a more integral part of the built environment, like a living organism responding to peoples needs. Mobility, interactive devices, and more easily transformable environments are the result. We are responding to the evolving workplace by providing flexibility and mobility, supported by technology, which encourages and supports teamwork and information exchange. Work has moved from the desktop to the laptop to mobile devices and they’re all seamlessly connected. Wireless technology in the office is a given. Title 24 requires smart lighting and energy efficiency. We can now control lighting, air temperature, sound, and visual privacy through our mobile devices. Altering our physical environment to suit our mood or needs is becoming commonplace. The traditional fixed pedestal desk is being replaced with movable table desks and adjustable heights, pull out for conferencing, or move and gang for larger groups, all responding to the need to move and not be sedentary. Tablet arm seating will be more refined adapting to the need to hold our devices and beverages without looking like a school chair. Adjustable height coffee tables will replace the traditional conference table. Collaborative furniture will be on easily moveable glides and wheels. The result is an interior space that fosters interaction and allows people to connect and share ideas. Rechargeable LED lighting allows for complete flexibility. Programming color change of lights will alter the mood and energy level of a space. An increased number of fixtures will be designed for combined task and ambient lighting. Adjusting the ambient light color and temperature creates mood and the addition of adjustable task lighting adds function and intimacy. Acoustical sheers lend a sense of privacy in Morris Yorn’s LA office. Photo courtesy of Felderman Keatinge & Associates. Visual and acoustical privacy plays a major role in today’s office. Sound canceling devices and passive acoustics such as wall material and paint are beginning to have greater acoustic properties, contributing to the need for more sound isolation. Acoustics will be better integrated into spaces. The more we collaborate the greater the need to respond to the desire for privacy. Seating will provide privacy with continued development of “brows” or “canopies” providing a “quiet zone” or opportunities for introspection. Strategically located open areas, or as we termed “casual collision areas” are furnished with collaborative furniture, lounge seating, low tables, and an increase of chill out amenities such as ping pong tables and fuse ball. More eclectic design will continue as a pivotal element in the new office. As our reliance on technology grows our desire for “warm fuzzy spaces “ remains constant. The reference to “home away from home” is really looking for comfort and nostalgia. 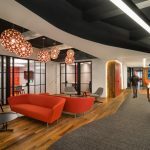 Retro or mid-century design that was the embryo for the modern office of today will continue to play a pivotal role in the office in the future. Artwork spices up accounting firm Holthouse, Carlin & Van Trigt’s offices. Photo courtesy of Felderman Keatinge & Associates. We’re getting smarter about the use of color. Whether through paint or materials or the introduction of art, color will be more intelligently used in the office to affect one’s mood as our knowledge grows through scientific research on the color effects on one psyche. The lunchroom or commissary is becoming the office community central hub, replacing the reception room. It’s the watering hole and the place to go for creative interactive thinking. It is not just tech companies that want to create this feeling of place or community but we are finding this with law firms and accountants and other traditional business models as well.